And we are done. Bergs have been beaten, cobbles have been conquered, pavé passed and Murs mauled. The Spring Classics season is over and there is a small chance to draw breath and reflect on the tumultuousness before the Grand Tour season comes to rule our lives once more. It has been an undeniably classic Classic season. Most recent past campaigns have been over-shadowed by the savagery of the weather or the apparent dominance of one particular contender. But this season the weather has been relatively benign and the racing wide open. It’s made for a series of great spectacle and no little drama. Drama is, of course, the key element of the Classics. Reduced to a single day, all the action is laid out before us in one go and unfolds like a hard-hitting play rather than an extended mini-series. Unlike stage races, where sub-plots and tangents are explored alongside the main narrative, one-day racing is direct, daring and usually brutal in it’s single-minded adherence to a primary theme. As with all reductive acting, baring your soul, hitting your marks and displaying exquisite timing become ever more important. With nothing to save yourself for the following day, everything can be left on the stage today. This should mean that the Spring Classics are characterised by bold, ‘balls-out’ races where those who are prepared to risk everything at the defining moment will most often be rewarded. Method acting – total immersion in the role – is the only way to win. ‘Immersion’ was the key theme in the sodden fields of Northern Europe where the season’s first hero emerged from the deluge at Omloop Het Niewsblad. Like a Shakespearean yeoman of old, Ian Stannard wore down the opposition in filthy conditions and lion-hearted a win over much favoured opposition. Grim-faced in victory, the toll of the day’s efforts was so thoroughly etched on his face that he could barely manage his victory soliloquy after his giving everything in the final act of a day that set the precedent for the nerve-jangling racing that came in the following weeks. The following day, Kurne-Bruxelles-Kurne – totally abandoned in 2013 due to snow and ice – was completely dominated by the OPQS classics team who briefly threatened to sweep all before them. Tom Boonen laid down a marker to the other big guns that would long linger in the minds as the Classics progressed. He was back on his favoured stage, with good form and great support. 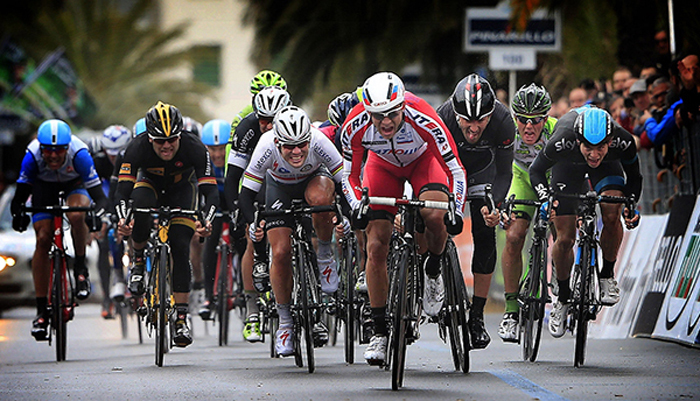 Attention lingered in Italy a while longer for the first Monument of 2014, Milan-San Remo, La Primavera. The script changed, changed and changed again in the weeks leading up to the longest single-day race on the World Tour calendar and, as climbs were omitted, reinstated and then omitted again, sprinters – expecting to be understudies at most – were suddenly scrambling to speed-learn re-written lines as they were thrust into the limelight much earlier than expected. The omission of Le Manie and then also of the additional Pompeiana was meant to make the race a sprinter’s delight and so it came to pass. But the ‘favourites’ – short on form and shorter on specific training for this race – were beaten by a less-fancied (but still well touted) rider. Sadly Boonen was missing due to a personal loss so it was left to Norway’s Alexander Kristoff, riding for the Katusha team, who was emphatic is the final yards denying Cancellara, Britain’s Ben Swift, and even Sagan, Ciolek and Cavendish. It was a performance that made a lot of people sit up and take note, particularly for the upcoming cobbled Classics. My own personal highlight of the year was the frenetic E3-Harelbeke race in late March. It was no surprise to see OPQS duo Niki Terpstra and Stijn Vanderberg in the small group contesting the finish after a thrilling race of attack and counter attack. Nor was it a surprise to see Sagan beat both of them to the line despite being outnumbered. The surprise was that joining these three in the sprint was Sky’s Geraint Thomas, who capped off a storming race for Sky by beating the ponderous Vanderberg to take third place. It was a race you could not take your eyes off for a moment and if I only go back to watch one race this season, this is one I will pick. In England April is synonymous with passing rain showers but in cycling it means cobbles – long periods of persistent cobbles. The Tour of Flanders and Paris-Roubaix; for many the painful apex of the Spring season. The Tour of Flanders was meant to be the Cancellara and Boonen showdown; the Oscar-tipped heavyweights facing off mano e mano. Sagan threatened to steal the show once more, as did Greg Van Avermaet (BMC), Sepp Van Marcke (Belkin) and Vanderberg once again but it was Cancellara who showed up exactly when it mattered; shattering the already select chasing group on the last ascent of the Oude Kwaremont to catch the leaders on the Paterburg. He then contrived to unsettle the group of four in the final run-in with a display of nonchalant gel-eating that was full of artful arrogance, before dispatching them in a late, late sprint. Kristoff tried to bridge across in the dying kilometres, and would have been favourite if he had made it, but the group stayed uniquely focused until only 200m out denying him the opportunity to catch them. Boonen, his mind possibly still elsewhere, came a creditable 7th. The crash-strewn race was certainly a vintage edition with a very strong supporting cast including a swashbuckling, but ultimately doomed, early breakaway led by Taylor Phinney and a cameo from Bradley Wiggins which both astounded (due to it’s length) and gratified (due to it’s persistence). Thomas placed high in the Top 10 and all the elements seems to be aligning for an equally enthralling Paris-Roubaix. It was undeniably Cancellara’s day though and, whilst E3 was the race of the season, his was the standout performance. The weather held during the week between the Ronde and Roubaix, guaranteeing a dust-infused race rather than the often expected mud-fest. Boonen was back and, at one point, seemed about to repeat his memorable long range one man show of 2012. He faltered though – perhaps having spent too much time in the wind already in the knowledge that he lacked the race fitness to take it all the way. His OPQS teammates Stybar, Vanderberg and Terpstra looked also to have fluffed their lines as a large group, including Cancellara and the much faster sprinter John Degenkolb of Giant-Shimano approached the final cobbled secteurs. With Sky’s Geraint Thomas and Wiggins also in close attention it was always going to be peppered with attacks before the rush for the line and Terpstra was the one who made it stick. Looking distinctly non-aero with his mouth so far agape, desperately trying to find more air for his lungs, he time-trialled his way to the Velodrome and had enough of a gap at the end to savour his final lap. Cancellara lost out to Degenkolb in the sprint for second but podiumed to continue an impeccable record of finishing in the top 3 of the last 12 Monuments which he has made it to the finish in. In Roubaix BMC had, as has become habitual, showed flashes of tenacity but come away empty-handed yet again. Their time finally came in the Dutch Amstel Gold Race. In a move that mirrored his entire season last year Philippe Gilbert sat anonymously in the pack for 95% of the race and then, just as he had in the dying moments of 2013, emerged with impeccable timing to ride the rest off his wheel on the upper half of the Cauberg. With Van Avermaet probing and prodding throughout the day and a sacrificial attack from Sammy Sanchez on the lower ramps of the Mur, which everyone with an ambition to win had to counter, for once BMC played their roles expertly and suddenly Ardennes Week took on a whole new complexion. In truth Gilbert’s counter-attack past those who has been duped into going too early was a magnificent end to an otherwise less than enthralling race but it set the critics alight with talk of the possibilities of a sequel. The early season talk of Cancellara, Sagan and Boonen halted overnight as they all re-focused on other goals and Gilbert was once more the talk of the town. Sky’s abysmal showing in AGR also stalled the talk of their excellent improvement at a single stroke, reducing the field of apparent contenders for the remainder of the Spring Classics to only Philippe Gilbert and and the Iberian all-rounders Rui Costa, Rodriguez and Valverde. With the final two classics coming quick on the heels of Amstel, Flèche Wallone and Liege-Bastogne-Liege arrive like the swift crescendo of a bloody Shakespearean tragedy rather than the slow, measured denouement of a Pinter play. Gilbert had wielded his power once, could he strike twice more in quick succession and take the crown as 2014 King of the Classics? With no one rider having taken more than a single win this year the opportunity was certainly there.. But good theatre doesn’t always work well with such generous predictability. Great dramas sometimes need a point of low ebb and often it needs a villain to deliver it. For plenty of cycling watchers unrepentant doper Alejandro Valverde of Movistar would fit that bill perfectly. Taken in the context of the whole Classics season his unpopular win at Flèche-Wallonne makes for a great narrative – the dark ending to the middle Act allowing the possibility of a redemptive finale in Liege, but put simply Valverde displayed better timing than his rivals and showed greater experience to be in the right place to save energy until making his attack when the vicious Mur de Huy flattened a little in the final 150 metres. Riders who would have been deemed more ‘worthy’ winners came second and third – Dan Martin of Garmin and Michael Kwiatkowski – whilst Gilbert could only manage tenth and Sky bathed in even greater ignominy than at Amstel Gold by only finishing two riders – the best of those six minutes off the pace. Valverde has had a very strong start to 2014 and his detractors might yet have to stomach more of him winning before the year is out. His early season wins in Murcia, Roma Maxima and his total dominance in Andalusia were apparently viewed with some degree of tolerance at least but winning a Classic seems to be the limit of acceptance. There were reports of him being booed on the podium. The suggestion followed that the notices following to a possible Monument win at Liege-Bastogne-Liege (which he has won twice before), Grand Tour GC or World Championship would be long, loud and much more vitriolic. With plenty of the Grand Tour contenders taking part in a race more suited to them, the stage was well and truly set for the 100th edition of the oldest classic of them all, Liege-Bastogne-Liege, La Doyenne. Chris Froome, Vincenzo Nibali and defending champion Dan Martin were all expected to be in the mix at the end of the 262km race that segues most neatly into the long stage races coming ahead. The release of an image of Froome’s paper-thin legs cross-crossed with bulging veins a couple of days before the race showed that he was following the method actor’s well-worn path to glory by shedding weight for a role. Sadly a number of big marquee names either did not make the start or suffered during the race. Froome pulled out just before the sign-on, citing a mild chest infection, and was joined by team mate Peter Kennaugh who was suffering from an unrelated illness. Sky’s day was even more abject than at Amstel and Flèche with only first timer, Nathan Earle, making the finish, down in 70th place. World Champion Rui Costa and last year’s No.1 rider Joachim Roderiguez also pulled out during the race after getting caught in crashes. The litany of withdrawals were the main action in a long race that, like Flèche, only really got animated in the last couple of kilometres, by which time it was too late for Nibali to make a break and yet still too early for Gilbert to try to sting the other contenders. Dan Martin seemed to have made the right jump on the final climb but lost grip under his front wheel on the very last corner, coming down ignominiously to allow Valverde, Gerrans and Kwiatkowski around to contest the sprint finish. The Australian Orica-Greenedge rider held off the strong challenges from the Spaniard and the Polish national champion to take his second Monument win and prompt a wave of anti-Valverde gratefulness. It seems that it is just fine for Alejandro to take second places. And so the curtain fell and the season of madness ended. Looking back on the Spring Classics as a whole would appear to show a gradual decline in excitement and entertainment since the peak of E3 and Flanders; exposing the flaw of trying to look at them as a unified ‘Classics Season’. Despite outward appearances they are too different to be holistically viewed in this way and, without an ultra-dominant Merckx-like character vying for the win in every one, would almost always lack the crescendo that a normal ‘season’ of linked sporting events typically brings. The very strength of the one-day races – the ‘all or nothing’ requirement – inevitably leads to some days producing all the action and some days producing none. We are in a period of generally more cautious, controlled racing and the geography of Ardennes Week makes those races especially ripe for the well rehearsed late surge. It’s just a shame that no-one seemed to think that a secondary break, a moment of improv if you will, launched after the early breaks were caught, was worth a chance. We shouldn’t leave the theatre despondent though. We have seen some fine interpretations of the old familiar stories. They are called Classics for a reason and, like Shakespeare, they will picked over and analysed, meddled with and modernised, but they will endure and they will delight for many, many years to come. The inaugural Dubai Tour was deemed a success by many commentators and journalists attending the event, and if they meant a triumph of style over substance then they would be entirely correct. We saw many, many pictures of the Burj Khalifa – the worlds tallest building – and almost as many of the Dubai Police Force’s utterly ridiculous fleet of supercars, which include a Bugatti Veyron, Ferrari FF and a Lamborghini Aventador. There were a few of camels, lots of sand and even a couple – hidden in amongst the rest – of cyclists in action. Taylor Phinney won the opening day Time Trial and never looked in danger of relinquishing his overall lead across the 4 day event. Marcel Kittel, obviously concerned about having his much-talked about hair upstaged by Phinney’s own remarkably idiosyncratic barnet, proceeded to wrestle back the headlines by winning three sprint stages on the bounce. The long awaited resumption of battle between the German Giant and our own Manx Missile never got going, with Cav variously misfiring, miscueing and mishapping in the desert. It’s very early days in the season of course but that doesn’t seem to be affecting Giant Shimano who have started in majestic form. Cav, and reunited lead-out man Renshaw, clearly have some ground to make up. 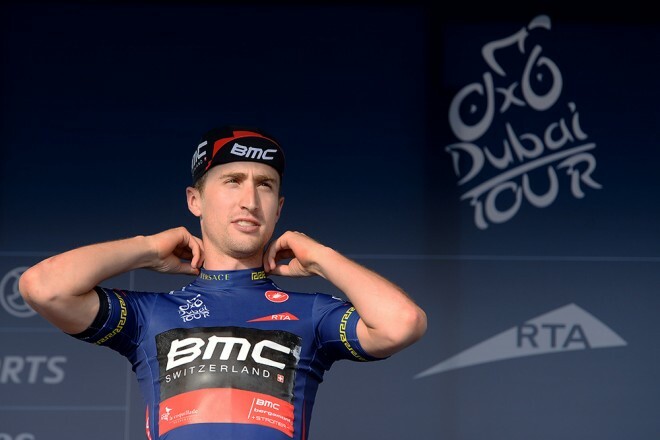 Taylor Phinney doing the important stuff: looking good in Dubai.